Men grill. It's genetic. Mostly we grill badly. It's not our fault. They say a good craftsman never blames his tools, but in this case it is justified. The thermometer that came on your grill is worthless. I don't care what you paid for your fancy schmancy stainless steel aircraft carrier. I have a $600 grill with a gauge that's off about 80F. How the heck can anyone cook if the oven temp is off by 80F? And how can Dad be expected to bring you a medium-rare steak when he has no idea what temp the meat is? Cooking without thermometers is like driving at night without headlights. A radio host once interviewed me and asked "What is the single most important advice you can give an outdoor cook?" My answer, without hesitation, was "Get one good thermometer for your grill and another for your food." So here's an idea. No make that a recommendation. No make that a request. No, make that a heartfelt plea. I'm begging you. Go get two good thermometers. Spend the money! They will pay for themselves by saving your meat and saving your face. Without a good thermometer there's a good chance you'll be making lame excuses for overcooked food, undercooked food, or, worst of all, apologies at bedside in the hospital as your guests recover from food-borne illness. Here's what the US Department of Agriculture (USDA) says: "The color of cooked meat and poultry is not always a sure sign of its degree of doneness. Only by using a food thermometer can one accurately determine that a meat has reached a safe temperature. Turkey, fresh pork, ground beef or veal can remain pink even after cooking to temperatures of 160F and higher. The meat of smoked turkey is always pink." - Click here for a comprehensive clip and save meat temperature guide that shows you the proper temperatures for everything from rare to well-done for all meats. - Click here for my comments on other thermometers including some from Weber, Taylor, CDN, tel-Tru, as well as info on thermometer maintenance, calibration, and how to use them. - Click here for a guide to food, grilling, and knife safety. - Click here for a buyer's guide to grills. - Click here for a buyer's guide to smokers. - Click here for reviews of must have barbecue accessories. - Click here for reviews of some of the best books and magazines on barbecuing, grilling, and outdoor cooking. - Click here for a buyer's guide to corkscrews. If you click a link to Amazon in this article and make a purchase, I get a small referral fee. It has zero impact on the price you pay or on my product recommendations. I don't care what the TV chef said, you absolutely positively cannot tell anything about the temp of a cooker is by holding your hand over it and counting until you have to pull your hand away. Each of us reacts differently to heat, and the heat 1" above the grate can be significantly different than 6" above. Maybe an old pro who cooks 100 steaks a night can do this, but most backyard cooks cannot. You may have also heard that you can tell the doneness of a steak by poking it and comparing the bounciness of the meat to the tip of your nose or the flesh between your thumb and forefinger. As if everyone's hand has the same firmness and bounciness. As if each cut of steak has the same firmness and bounciness. Maybe an old pro who cooks 100 steaks a night can do this, but most backyard cooks cannot. About those pop-up thermometers found in turkeys. They have a material in the tip that melts at a determined temp and releases a spring that pops the stem up. Although they can be accurate, they can also stick, they read only one part of the turkey, and they are usually set too high. Pop-ups are why your turkey tastes like cardboard. Throw them out. Can you imagine cooking in your kitchen if your oven did not have a thermometer? Then why do you try to cook outdoors without a good oven thermometer? If you hope to be king of the grill, you've got to got to got to know what the oven temp really is. The difference between a medium rare and well-done steak is only a few degrees. The diff between moist tender fish and dry is even less. The best way to deliver to the table properly cooked meat and protect against food poisoning is to take its temp. Some cooks can tell by look and feel. But that comes with years of experience and even then it is just not as reliable as a good thermometer. If you hate apologizing for overcooked meat or having to take bloody chicken off your guests' plates and sticking it in the microwave, then you've got to have a good meat thermometer. Accuracy. Bad data is worse than no data, so it's important to know where the reading is coming from. For a food thermometer, you want the sensitive part of the meat thermometer to be small and in the tip of the probe. The temp just below the surface can be a lot different than the temp in the center of a chicken breast. For an oven thermometer, I want the temperature reading from right next to where the food is being cooked. A thermometer in the dome of your grill will not tell you the temp that the meat is experiencing 6" below on the grate just over the coals. It can be a lot hotter down there. Speed to read. How long does it take to get a good reading? This is important for "instant read" thermometers, none of which are really instant. When you open the lid on your cooker to stick the meat you are letting out valuable heat and humidity. You want a thermometer that gives you a quick read. Five seconds or less would be nice. The best work in two seconds. Instant or continuous? Some probes are for pricking the meat and then must be removed. Some can be left in the meat and will provide continuous readouts throughout the cook. Range. If you're going to spend money on a thermometer, it would be nice if it could read the temperature of the meat, the oven, in your freezer, or in an ice bath, and in boiling oil. Thickness of the probe. A thin probe is easier to insert into the meat and leaves a smaller wound that seals faster. You don't need a gusher of valuable fluids following the probe out. Adjustable. The best thermometers can be calibrated. Click here to see how to test and calibrate a thermometer. Water resistant and easy to clean. You don't need barbecue sauce and soapy water in the inner works. Ease of use. Is it easy to read? If it has lots of buttons and settings, can we remember how to use them? Sturdy. You want it to last. How's the warranty? And if it breaks, can you order parts? Will the manufacturer repair it promptly and for a reasonable price? Thermocouples are the best food thermometers because they're fast. Some thermocouples can read accurately in fewer than two seconds, faster than any other sensor. They're thin: They have two thin wires in the probe, so the tip can be very small and thin. The sensitive area is very close to the tip so you know just what you're reading and they can be used to check the temp in several locations easily. They're accurate: They're margin of error is less than 1%. Some can be calibrated. You can get thermocouples that are great for instant metering, or others that can be left deep inside a roast like a pork shoulder or a ham for hours. ThermoWorks ThermaPen. This is the thermometer you see all the cooks on TV using. I strongly recommend for anyone serious about cooking meat properly. It reads in three seconds, is extremely accurate, has large easy-to-see numbers, and a long thin probe for getting into the center of a steak, a chicken breast, or even a large hunk of meat like a ham. The probe is thin so it will not open a gusher when you pull it out. It is on a pivot so it can reach into awkward places. The heat sensor is extremely small, so you know you are reading just where you put it and not a lot of the meat around it. For this last reason, it is the only probe I use for ribs. It is water resistent, reads from 58F to 572F (-50C to 300C), and switches between F and C.
Another nice thing about the ThermaPen is that the company stands behind it. Mine began to malfunction after eight years. I called them, gave no indication that I was a writer, described my problem, and rather than hit me up for a nice repair bill, they told me how to fix it. The ThermaPen sells for about $96. Click here for pricing and direct ordering of the Thermoworks ThermaPen from Amazon.com. ThermoWorks Super-Fast Pocket Thermometer. This is a very good inexpensive product. It has a thin tip with a tiny thermocouple and it gives an accurate reading in just six seconds. It is small, lightweight, clips in your shirt pocket, waterproof, dishwasher safe, has a range of -40 to 302F (-40 to 150C). The waterproof part really got my attention. More than once I have dropped a thermometer in a pot of custard or bowl chocolate, and then I lick it off and throw it away. Not this one. The ThermoWorks Super-Fast Pocket Thermometer is also available from Amazon. Best of all, it is only about $20! Thermistors are digital thermometers with a small resistor in the tip. They are not as quick as thermocouples and they tend to be thicker. Some have a probe on a wire that allows you to insert it into the meat and get the readout from outside the oven so you can monitor the meat temp continuously. Before you buy, make sure it can go higher than 350F so you can use it for reading the oven. 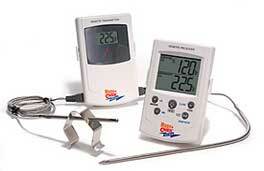 The very popular Weber digital thermometer is meant for inserting into meat only and barely goes above 200F. Not good for reading the oven temp. Maverick ET-73 RediChek Remote Wireless Smoker Thermometer. This cool tool is a digital thermometer and timer combo. There are two probes and cables (I call them each a probe on a rope), one to insert into the meat, and another to leave in your smoker. Both probes plug into a sender module that transmits temperatures to a receiver that you can take into the living room with you and place on the couch next to the beer and chips. That's right, with the Maverick ET-73 you can monitor your smoker and your meat while you watch the game. You can also set the timer to remind you when to start the side dishes or wake you up if the game is really boring. If you can afford only one thermometer, this is the one since it is really two thermometers in one. Maverick has good tech support. When my receiver began to malfunction, they told me the problem sounded like a bad backlight and told me to ship it back for a replacement. No question about when I bought it! There is still room for improvement, however. You must turn on the receiver first or else it won't work, and turning on the sender is a pain because you have to remove the battery cover. Also, some of the programming is a bit tricky, so make sure to keep the instructions handy. Unfortunately, the instructions are not well written or organized. The biggest problem is that one of the probes seems to burn out every year or so and need replacement for about $12. My final complaint: The range of the transmitter can be diminished by obstructions (like walls), so it may not reach you in the living room (by the way, an electronics wiz and food lover named John Mangan has posted a technique for increasing the range of the RediChek). But I still love mine. 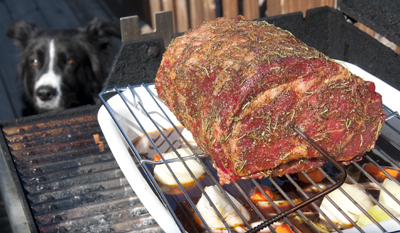 It is important to know that the meat probe is designed to roasts and thick pieces of meat. 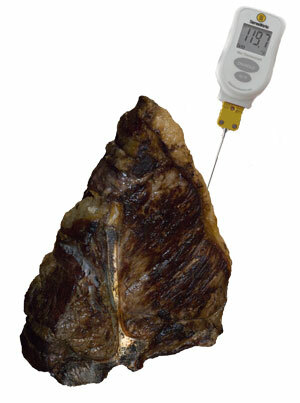 You may not get accurate readings on steaks, chips, and thin cuts. For those, I prefer the faster, thinner Thermocouples. Click here for pricing on the Maverick RediChek Remote Wireless Smoker Thermometer from Amazon.com, click here. Maverick Rotisserie Thermometer. Maverick also makes a thermometer than has a probe that can be inserted into meat on a rotisserie. I have just gotten one and haven't had a chance to test it yet, but I expect it to perform as well as other Mavericks. Click here to check the price of the Maverick Remote Rotisserie Thermometer on Amazon. Rock's Stoker is incredible hi-tech solution. It has a thermostatically controlled blower that regulates the airflow to the charcoal combustion chamber and thus controls the temp extremely accurately. It can be connected to a wireless router and you can even control it with your web browser. You still have to make sure your grill doesn't run out of fuel, but thermostats are where it's at, Jack. Watch for more of them on charcoal and gas grills in the future. Copyright (c) 2010 By Meathead, and all rights are reserved. 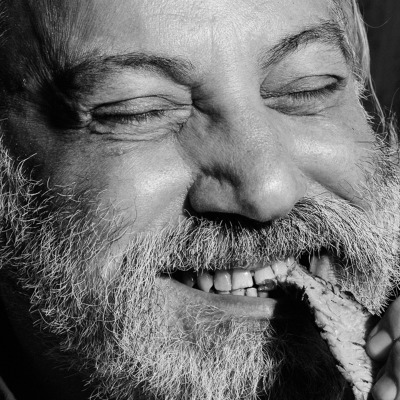 For more of Meathead's writing, photos, and recipes, please visit his website AmazingRibs.com, friend him on Facebook, or follow him on Twitter.